How did Neymar end up bouncing from celebrity to celebrity in Los Angeles? The story of his inside link. 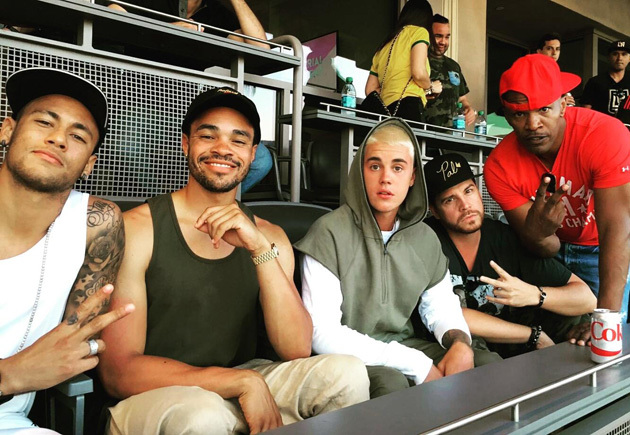 LOS ANGELES — How did vacationing superstar Neymar end up hanging out with Justin Bieber, actor Jamie Foxx, music producer Maejor and Formula 1 champion Lewis Hamilton as they watched Brazil’s Copa América game in the Rose Bowl on Saturday? The answer is an intriguing one—and a particularly Hollywood story. Dave Osokow—known as Dave-O in the celebrity world—is a self-described “Hollywood connector.” Last week Osokow got a call from one of his business partners. “He said, ‘Neymar is coming to town. Could you help introduce him to some celebrities?’” said Osokow. If you’re into star power, Osokow is an intriguing follow on Instagram and Snapchat (daveophilly). Dave-O was in New York City last week visiting Selena Gómez and Joe Jonas of DNCE for their Revival tour, and he took the chance to meet Neymar when he was there and introduce them. Neymar told Osokow he was a big fan of Bieber, so Dave-O called Bieber, who was intrigued. “Bieber was open to meeting, and so we took Neymar to his house and they played some football together in his backyard. They hit it off,” Osokow said. The group had dinner at Nobu in L.A. on Friday, along with actor Jeremy Piven, and then they joined Foxx and Hamilton (two other Osokow pals) at the Rose Bowl on Saturday. “Neymar is a great kid, and there’s a lot of buzz about him coming to L.A.,” said Osokow, who also introduced Jermaine Jones to the Hollywood celebrity world after his successful World Cup 2014. After Neymar’s return from the NBA Finals, where he gave jerseys to Stephen Curry, Klay Thompson, Draymond Green and countrymen Leandro Barbosa and Anderson Varejão, the group was planning to hang out together again on Monday.